Wild: Colossus Petram is like no creature I have ever encountered. There is no biological or historical precedent for it. Its nearest relatives exist only in legend - mythical statues that could come to life like the Golem of Prague. That makes it all the more dangerous. What survivor could possibly expect a seemingly benign rock formation to suddenly spring to life and attack them? Fortunately, Colossus petram's massive size makes it quite slow, so I would advise most survivors to flee immediately if encountering it in the wild. Domesticated: If somehow tamed, Colossus petram could prove to be an invaluable asset, particularly in a siege. Only armor-piercing rounds or explosives can harm it at all, and it will handily smash through stone structures. 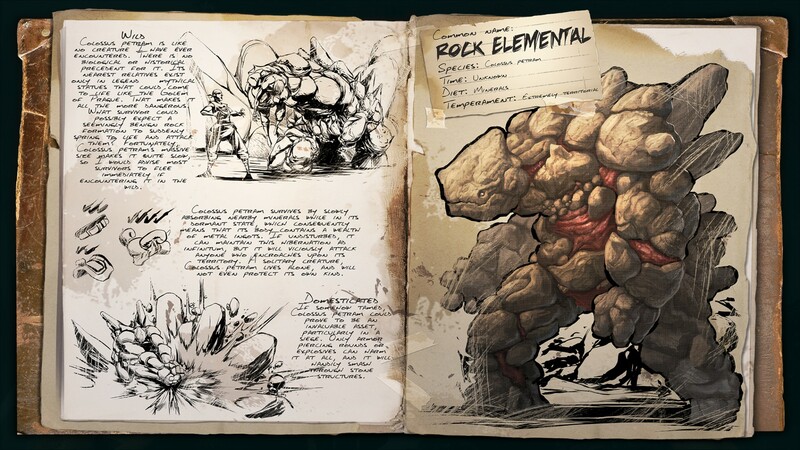 Known Information: Colossus petram survives by slowly absorbing nearby minerals while in its dormant state, which consequently means that its body contains a wealth of metal ingots. If undisturbed, it can maintain this hibernation ad infinitum, but it it will viciously attack anyone who encroaches upon its territory. A solitary creature, Colossus petram lives alone, and will not even protect its own kind.